I was idly reading the backs of food packets the other day (as you do) when I was struck by the copywriting on a packet of Collier’s cheese. 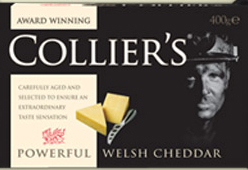 It’s nice cheese, and it comes in a nice black packet with a nice picture of a miner on the front. But the writing doesn’t really match that down-to-earth image. ‘Keep Collier’s wrapped when not in use,’ it warns, ‘and do use Collier’s on different eating occasions’. This entry was posted in marketing and tagged Collier's, marketing speak, occasion, retail. Bookmark the permalink. Who on Earth approved THAT?? Sounds like they not only got rid of their editors, but with the marketing department as well! Nice to know I got there first!